There is plenty of focus on the downside risks to the US economy - the European crisis and recession, the slowdown in China, the US fiscal cliff and more - but there are at least two reasons to expect an increase in US economic activity. The first reason is a little addition by subtraction. Over the last 3+ years, state and local governments have lost over 700 thousand payroll jobs (including the preliminary estimate of the benchmark revision - assuming most of the additional government jobs lost were state and local). 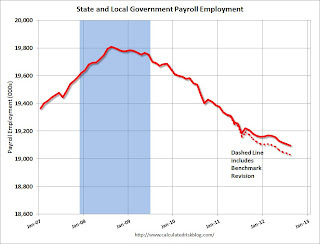 The following graph is for state and local government employment. So far in 2012 - through August (and using the Benchmark estate) - state and local governments have lost about 78,000 jobs (61,000 not counting the revision). In 2011, state and local governments lost about 280,000 jobs (230,000 not counting revision). So the layoffs are ongoing, but have slowed. 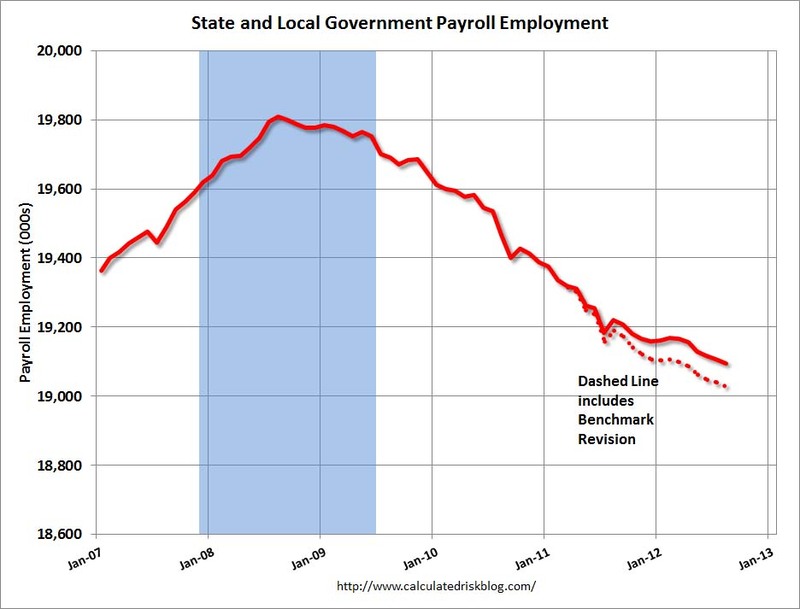 This graph shows total state and government payroll employment since January 2007. State and local governments lost 129,000 jobs in 2009, 262,000 in 2010, and 280,000 in 2011. 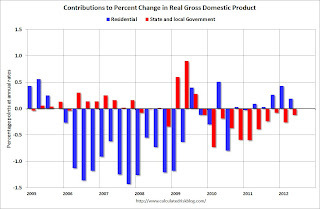 The second graph shows the contribution to percent change in GDP for residential investment and state and local governments since 2005 (including the Q2 GDP revision today). 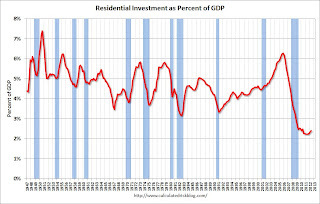 The blue bars are for residential investment (RI), and RI was a significant drag on GDP for several years. Now RI has added to GDP growth for the last 5 quarters (through Q2 2012). 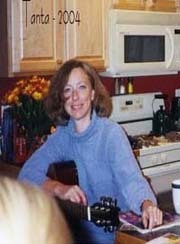 However the drag from state and local governments is ongoing. 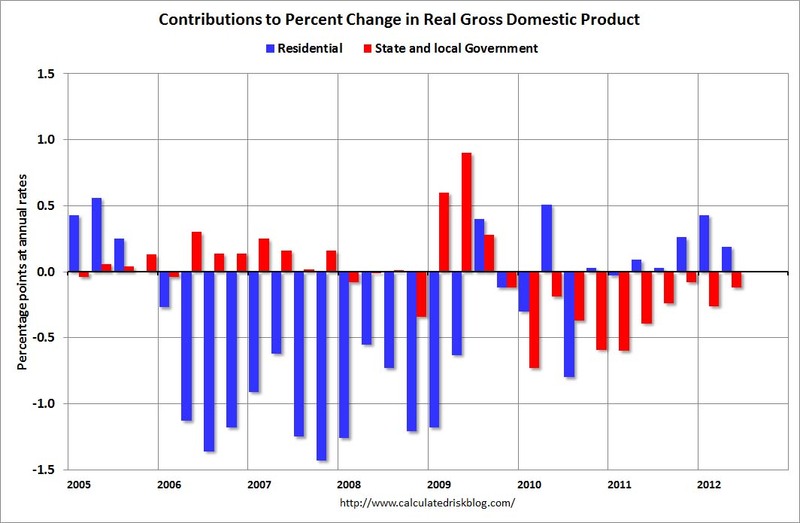 State and local governments have been a drag on GDP for eleven consecutive quarters. Although not as large a negative as the worst of the housing bust (and much smaller spillover effects), this decline has been relentless and unprecedented. In real terms, state and local government spending is now back to Q4 2001 levels, even with a larger population. The second reason I expect growth to pickup is I think the recovery in residential investment will pick up next year. I'm not as optimistic as the NAR (the NAR is forecasting housing starts will increase about 50% next year), but I do think there will be a large increase in housing starts and new home sales in 2013. 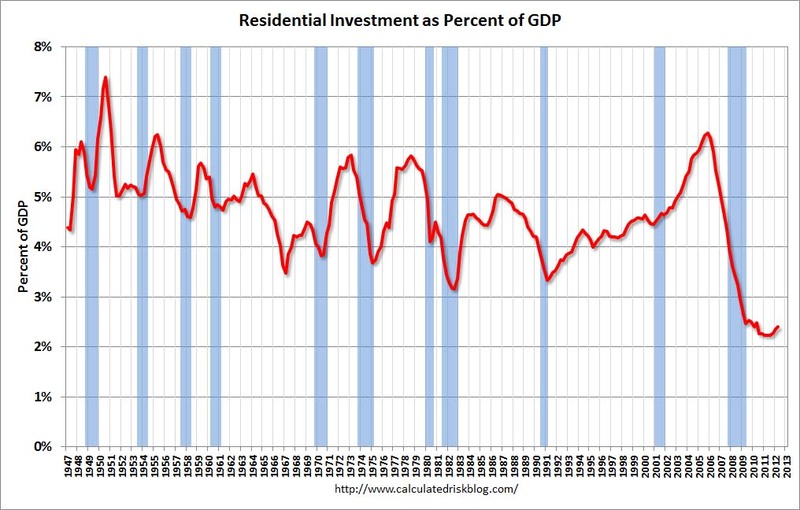 Here is a graph of residential investment (RI) as a percent of GDP. Currently RI is 2.4% of GDP; just above the record low. I expect RI will increase to 4%+ of GDP over the next few years, and that will give GDP and employment a strong boost.